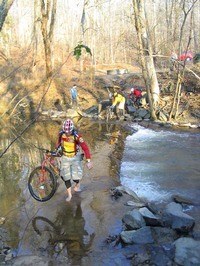 Go Clipless: Traversing the Fairfax CCT; an "urban epic"
The day began at 8:30am on Saturday, December 18, the coldest day of the year. Everyone convened in the Difficult Run parking lot on Georgetown Pike for the start of the ride. At a frigid 20 degrees our first obstacle was to cross Difficult Run. There is no bridge or obvious crossing point so we picked a shallow section for the crossing. Five of us chose to remove our shoes and socks and hike our bikes across the stream as it was about 8 to 10 inches of cold water running over algae covered rocks. Only Gary and Lee braved the ride across with Gary's thinking being that if he fell in he would hop in his car and call it a day. Once across we began the ride south. We started off casually with several stops to take pictures and get settled. It didn't take long before we started heating up and shedding the layers of clothing we had worn. From this point - across route 7 and through to the W&OD the trail was in relatively good condition as most of the muddy spots were frozen. 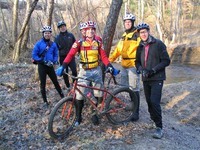 We passed through Twin Branches park and The Glade in Reston until we reached Lawyers Road. From this point on the weather had warmed to a point where the muddy sections were like sludge slowing us down and sucking our energy. I had ridden this section of the CCT only once before and it was definitely taking a toll on some of us. Gary had mechanical difficulties during this stretch and called it a day half-way between Lawyers Road and Vale Road. After we crossed Vale Road Dan's legs began cramping up as did mine, but I was determined to see this through to the end. On our way to Oak Marr park off of Jermantown Road, both Dan and I began to fall behind the rest of the group. We stopped at a small cross street for a bite to eat where Dan decided he would bail at Jermantown road. Although, I was hurting I thought that I could still continue the ride. Well, when we reached Jermantown Road I was done. Dan and I wished the rest of the guys luck as they headed off to finish the ride. Dan and I were headed to Randy's house off of Hunters Mill Road with the idea being that we would ultimately drive back to the starting point and pick up our cars. On our way we passed Luciano's Pizza (the best I have found in Northern Virginia). I wished we could stop, but it was getting late and Dan wanted to get back. So we trudged along the road when suddenly Dan's front tire went flat at the corner of Hunters Mill Road and Vale Road. As Dan changed his tire I called my wife who was driving in the area. She swung by and picked me up and we headed to Luciano's for some pizza despite being covered from head-to-toe in mud. Dan headed back to Randy's. I learned later that both DT and Lee had to bail once they reached Wakefield Park and only JoeP and Randy made it the entire way. As far as anyone knows this is the first time anyone has ridden the entire CCT in a single day. Congratulations to JoeP and Randy. We all vowed to ride this "urban epic" again (a term coined by JoeP). It wasn't said, but I think we tacitly agreed to do it in the spring, however. View the photo album of this ride.